Starting in 2014, as part of the Affordable Care Act (ACA), health insurance coverage for individuals and small businesses will become available through new state health insurance exchanges. Most importantly, the key tax credits (e.g. the small business healthcare tax credits) and tax subsidies (e.g. individual health insurance tax subsidies) will only be available for coverage purchased via a state health insurance exchanges. New Jersey will default to a federally-facilitated health insurance exchange. On December 7, 2012, Governor Chris Christie vetoed A-3186/S-2135, which would have established a health insurance exchange within the Department of Banking and Insurance and announced that the state would default to a federal exchange. Governor Chris Christie vetoed similar legislation earlier in 2012. The federal government will assume full responsibility for running a health insurance exchange in New Jersey beginning in 2014. New Jersey Health Insurance Exchange - What is It? The New Jersey health insurance exchange will be operated through a federally-run health insurance exchange, called the Health Insurance Marketplace. 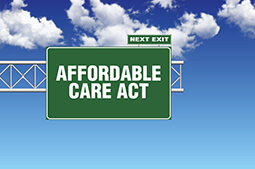 According to healthcare.gov, starting in October 2013 New Jersey residents will be able to access information about all the plans available through the Marketplace. The SHOP Exchange will also be available to small businesses. Coverage from the Marketplace starts in January 2014. According to an estimate by healthcare.gov, 901,290 or 13% of New Jersey’s non-elderly residents are uninsured, of whom 789,746 (88%) may qualify for either tax credits to purchase coverage in the Marketplace or for Medicaid if New Jersey participates in the Medicaid expansion. Details on Marketplace such as what it will look like, and what plans will be available, are still limited. More information for consumers can be found at http://www.healthcare.gov/marketplace. More information for professionals can be found at http://marketplace.cms.gov/.